For some reason, fall makes me think about cabbage. I guess it’s the Oktoberfest/German food thing. I wanted cabbage, but I wasn’t in the mood for sauerkraut or cooked cabbage or Shrimp & Cabbage Stir-Fry. What else contains cabbage? Slaw. Specifically, apple slaw with grapes. When I started putting this recipe together, I was stunned by its colors. There was just something about the bright green grapes against the dark purple cabbage that spoke to me. If you take this to your next potluck, it will practically jump off the table and onto people’s plates. 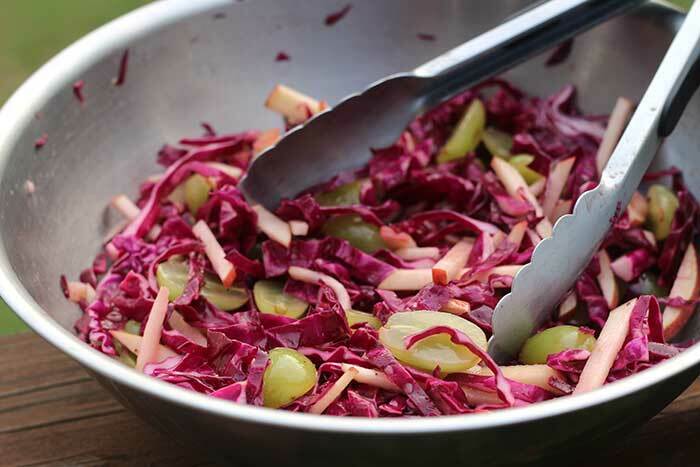 This apple slaw with grapes features a honey-mustard vinaigrette dressing (no mayo anywhere) and is dairy-free too. If you substitute another sweetener for the honey, it will be vegan as well. Make a batch of this on Sunday and you’ll have a ready-made side dish for several nights. It’s especially good with grilled pork tenderloin. Combine vinegar, honey, mustard, and olive oil in a small jar with a screw-top lid. Shake well and season with salt and pepper. 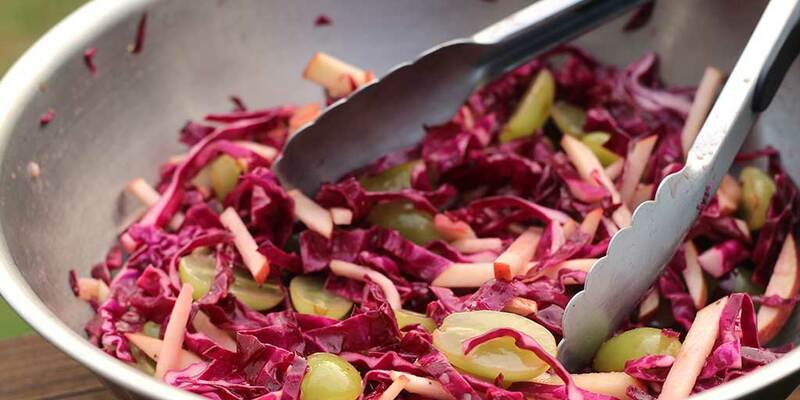 In a large bowl, combine cabbage, grapes, and apple. Add dressing and mix well. Let sit at room temperature for about 30 minutes. Serve immediately or refrigerate. Can be served at room temperature or straight from the refrigerator.